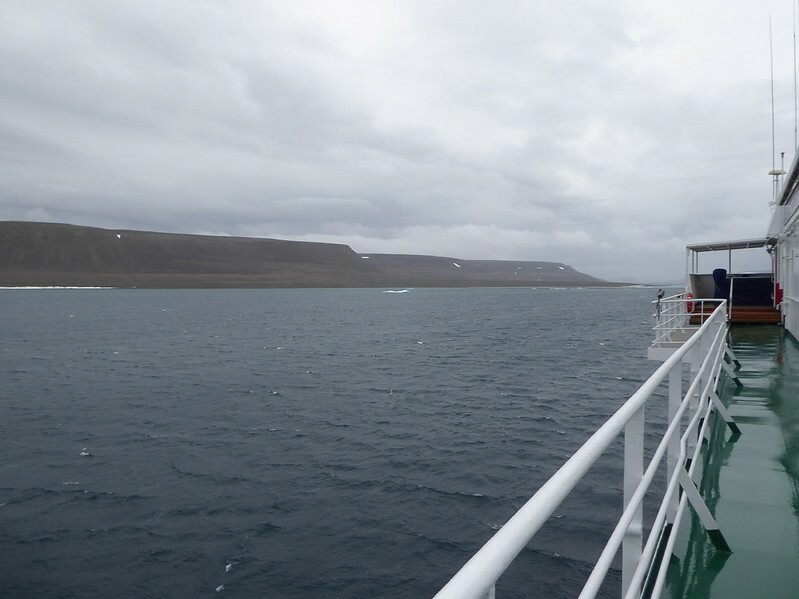 We were part of a 12 day expedition into the Northwest Passage on board the Akademic Sergey Vavilov from Aug. 23 - Sept. 4, 2017. Participants were limited to 90 and they were a very interesting group of people. The ship was run by One Ocean with a Russian crew. 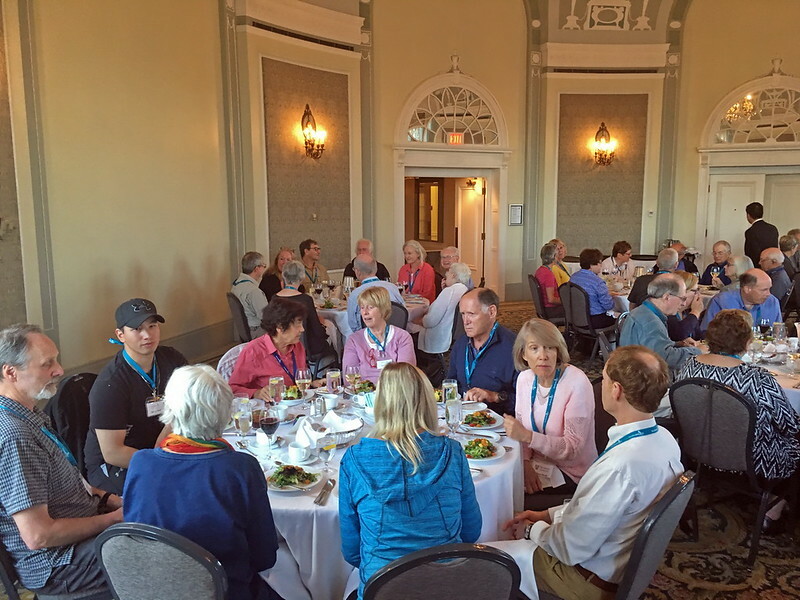 The expedition was put together by Worldwide Quest and promoted by Canadian University Alumni Associations. 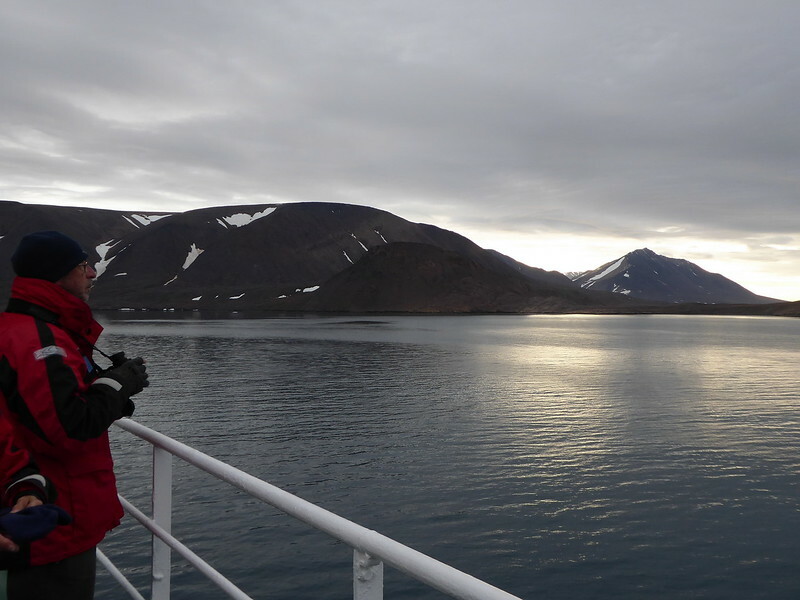 We had many interesting experts on Arctic wildlife, birds, plants, history and more on board and there were regular presentations. We were up at 5 am. The buses started leaving for the airport at 6 am where we were taken to the Executive Terminal. The flight to Resolute Bay with Canada North left at 8 am with a refuelling stop at Yellowknife. They weighed our suitcases, but otherwise, no regular security. 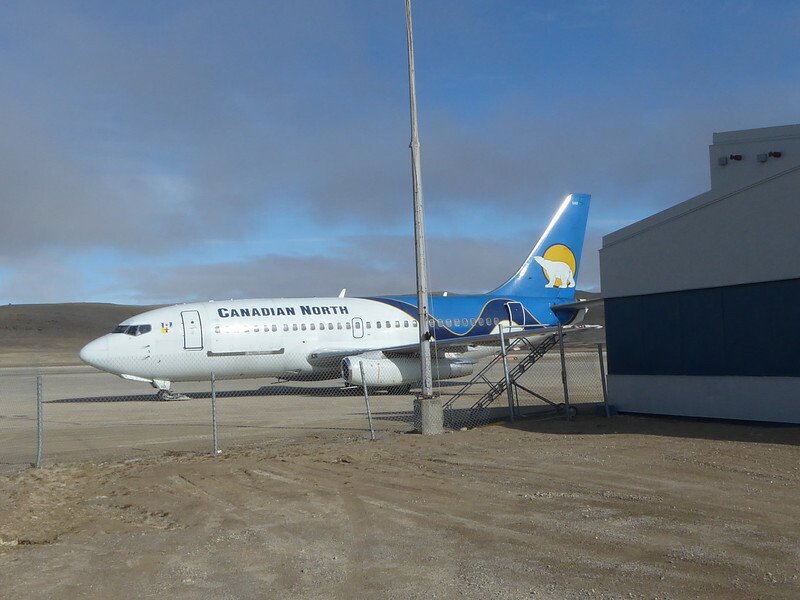 On our arrival at Resolute Bay, we had time to wander around the airport for awhile. The plane nearly dwarfed the small terminal. After wandering around for awhile, I tried to use the washrooms and found there was no water. 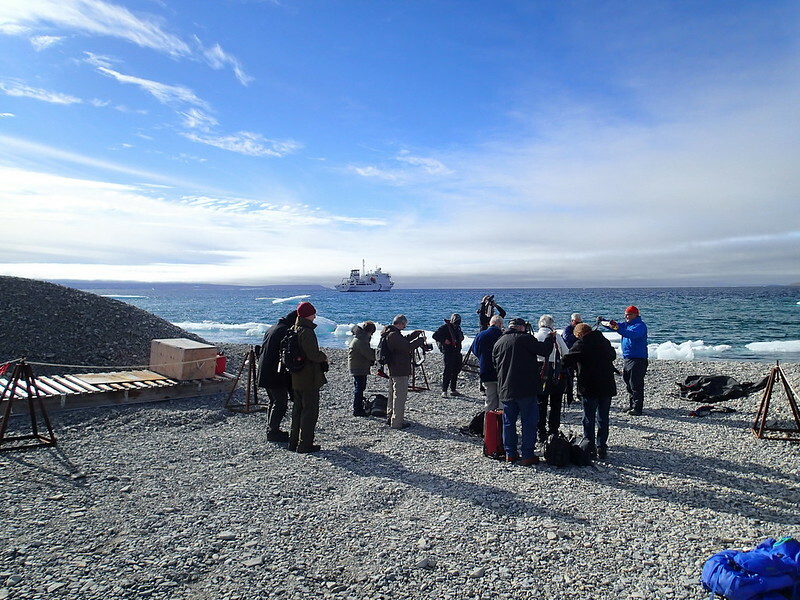 They are serviced by water trucked in to fill a tank and the shipload of passengers waiting to be flown back to Edmonton, combined with all of us waiting to be taken to the ship, had totally exhausted the resources. 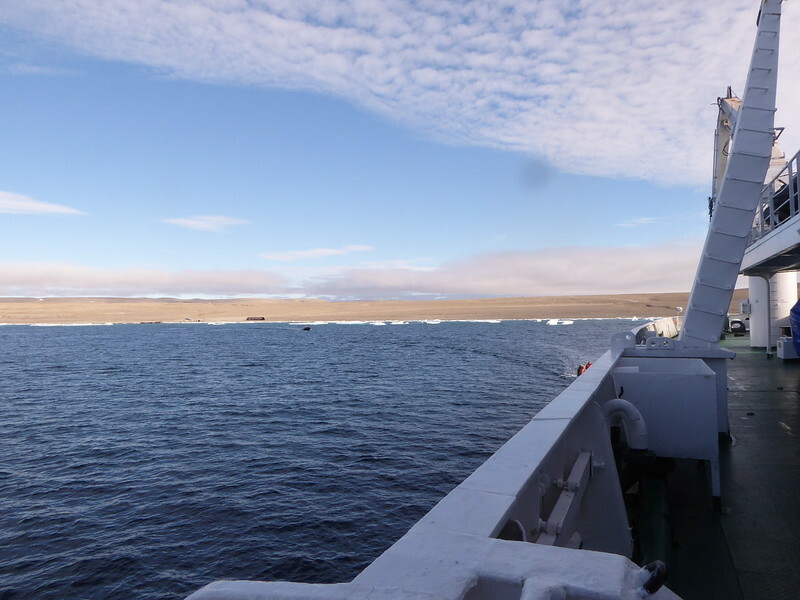 Eventually we were bused to shore - several loads with a van and a mini-bus - where we were instructed in the use of life jackets and were taken to the Akademik Sergey Vavilov by Zodiac. We had a chance to unpack, attend a welcome reception in the lounge and wander around the ship a bit. Dinner was served at 7 pm and sometime during dinner we departed from Resolute, but it was so quiet and smooth most of us didn’t realize that we were under way. 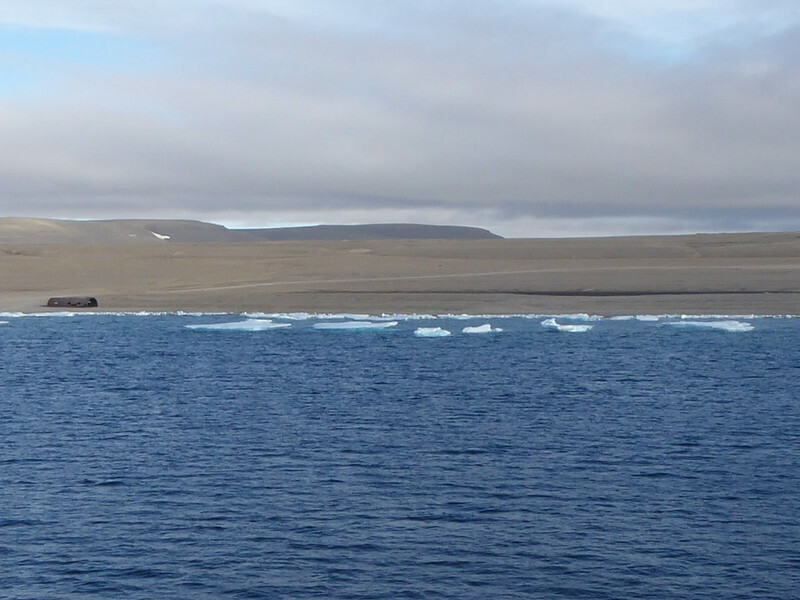 After dinner we walked on the decks and there were significant ice floes, many in a brilliant turquoise colour. We returned to the library with our computer to edit photographs. We had a good view of where we were going and eventually spotted another ship coming towards us. We stopped and someone was sent out in a Zodiac to the other ship which, we realized was the sister ship to ours. We found our cabin cozy, to say the least. But our Arctic gear did not fit well. Apparently, the designation of women’s or men’s sizes was disregarded. 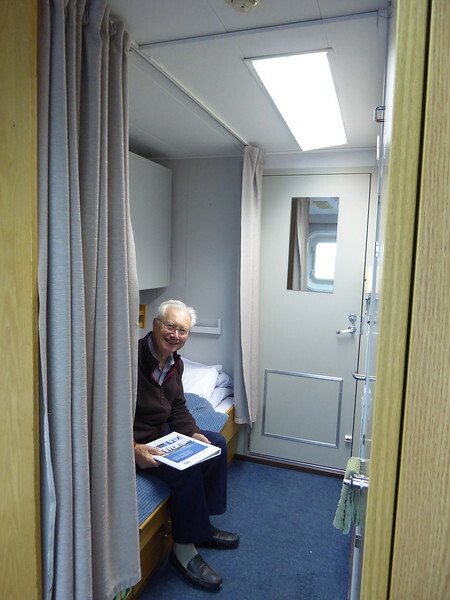 There is the possibility of three bunks in our cabin which shares a tiny bathroom with the next cabin. However, the upper bunk is folded up, making more space. We managed to find storage for our items, but it was tricky. A large area is taken by an unplugged fridge which, perhaps, is used when the ship is being used as a research vessel. The Vavilov has six accessible decks plus a higher observation deck. We are on deck 4. 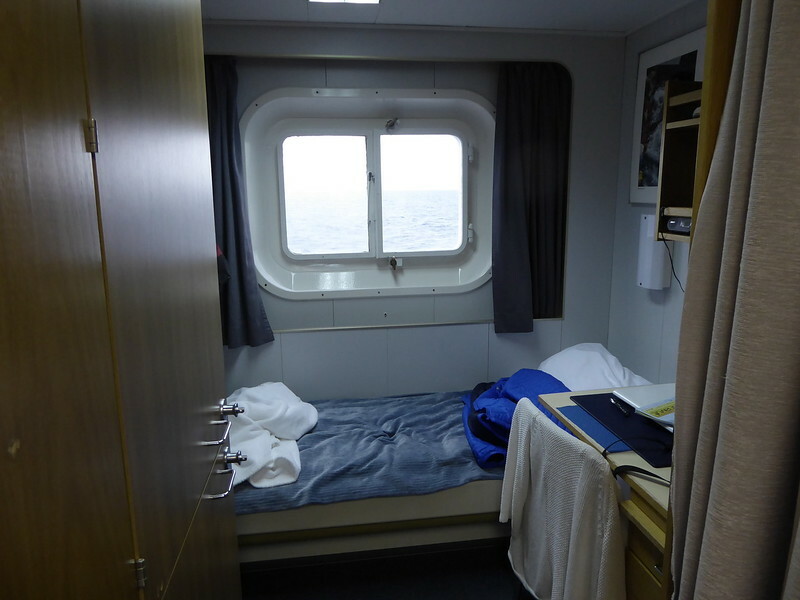 Deck 3 has the mudroom where we don life jackets and gum boots before entering the Zodiacs for shore excursions and it also has the dining room and sauna. Level 1 has a multi-media room and a presentation room as well as areas for crew only though they are accessible by different staircases down from deck 3. The library is on deck 5 and it’s a pleasant place to view where the ship is going without being windblown. Its large table is also a comfortable place to read or edit pictures on the computer. There is no regular Internet service on board. It is possible to get a ship-based email account, but no Internet access otherwise. We decided against it but in case of emergency, we can be contacted through the ship’s email address. 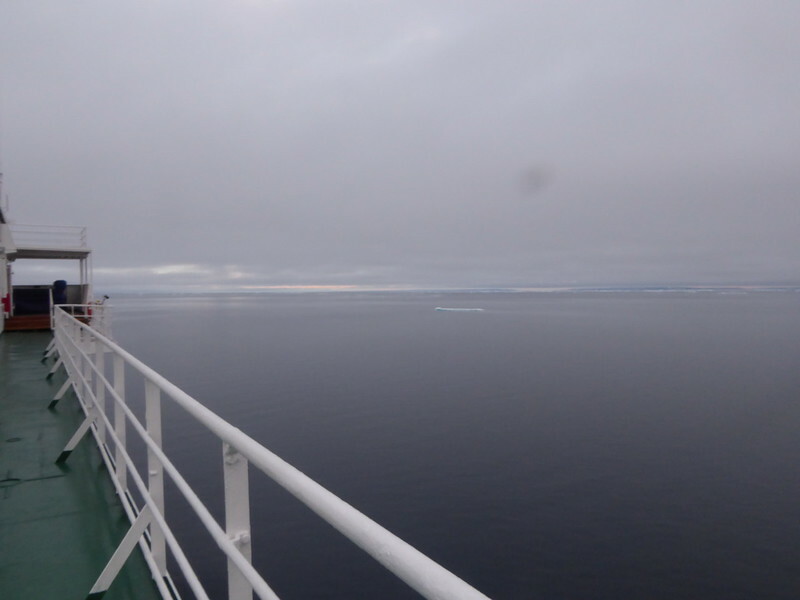 Finally, on deck 6, there is a lounge/bar, access to outside decks and access to the bridge which is often open to passengers, but not when we are threading our way through a field of ice floes or heavy fog. We were on a charter flight out of Edmonton's Executive Terminal. The plane on the Tarmac in Edmonton. 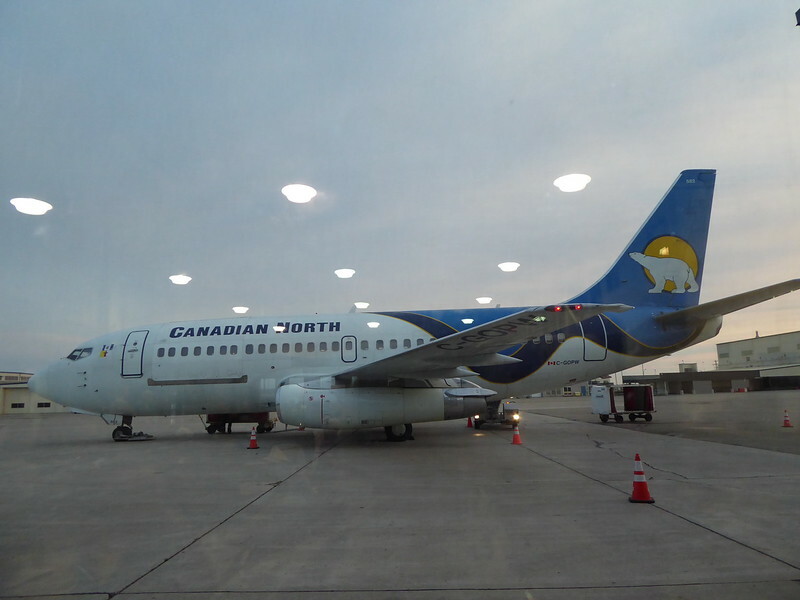 Had to do a refuelling stop in Yellowknife en route to Resolute Bay, probably to ensure that the plane could return safely as far as Yellowknife as there isn't much in Resolute. 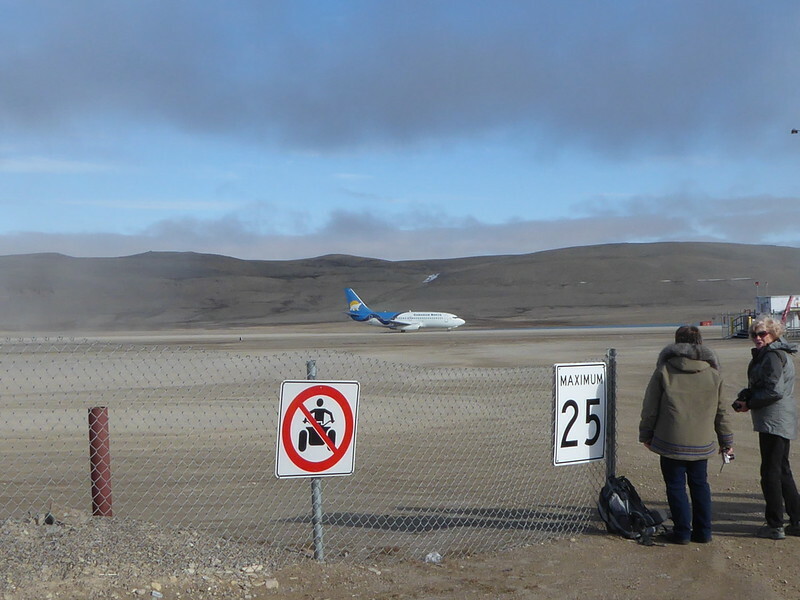 The terminal in Resolute Bay - tarmac? side. 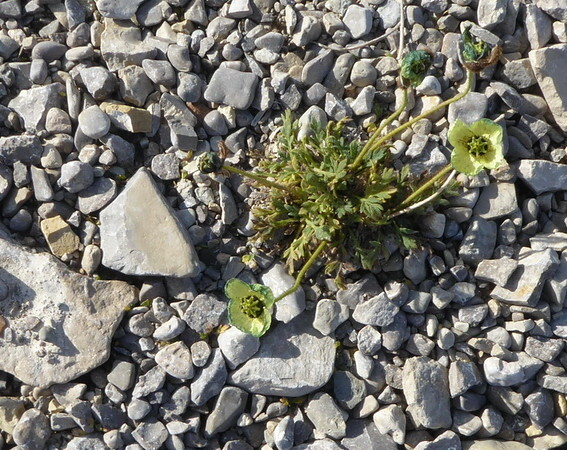 It's all gravel. The front of the terminal with one of the vehicles that took us to the shore. Bob looking out over the tundra. In the middle of this picture, if you look carefully, you can see the ship. Fuel storage tanks around the airport. Resolute or Resolute Bay is an Inuit hamlet on Cornwallis Island in Nunavut, Canada. 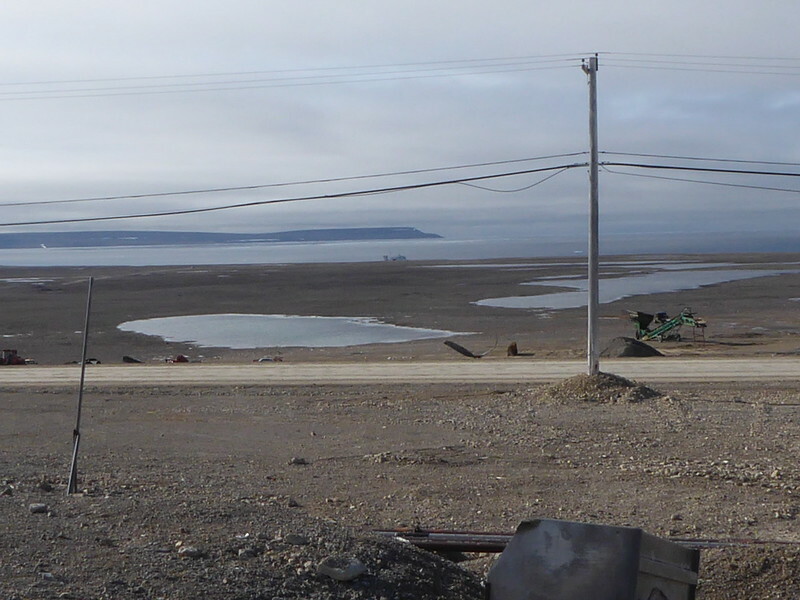 It is situated at the northern end of Resolute Bay and the Northwest Passage and is part of the Qikiqtaaluk Region. Population is about 200. The plane in relation to the small terminal. 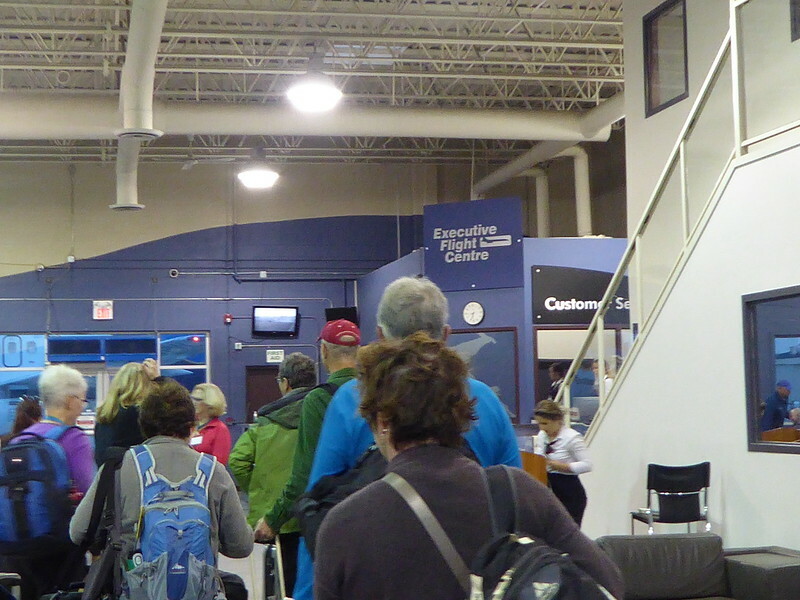 There was a boatload of passengers waiting to go back to Edmonton. Gravel runway and after we landed, they spent some time grading it before the plane took off. The plane taking off for its return trip to Edmonton. On the beach with our ship off shore. We were instructed on the use of the flotation devices and on getting in and out of Zodiacs and were taken to the ship. 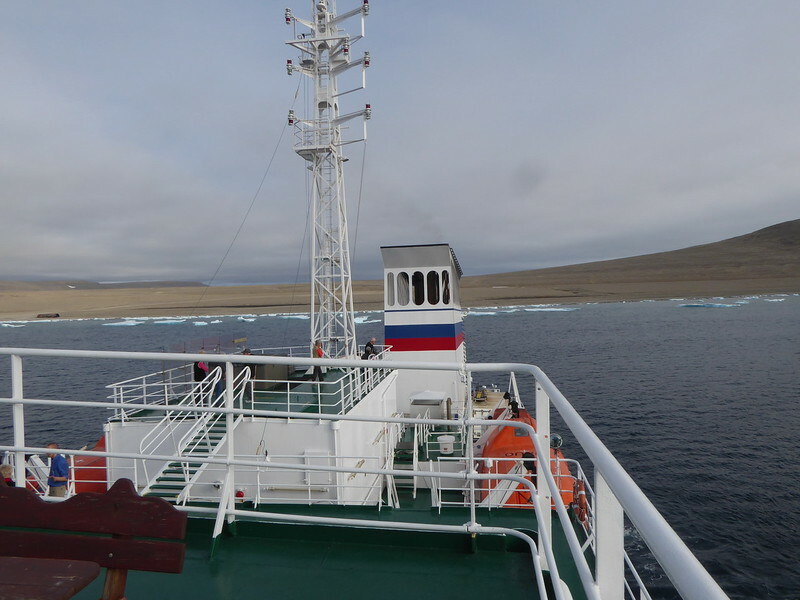 Our ship, the Akademik Sergey Vavilov, and the icy shore. 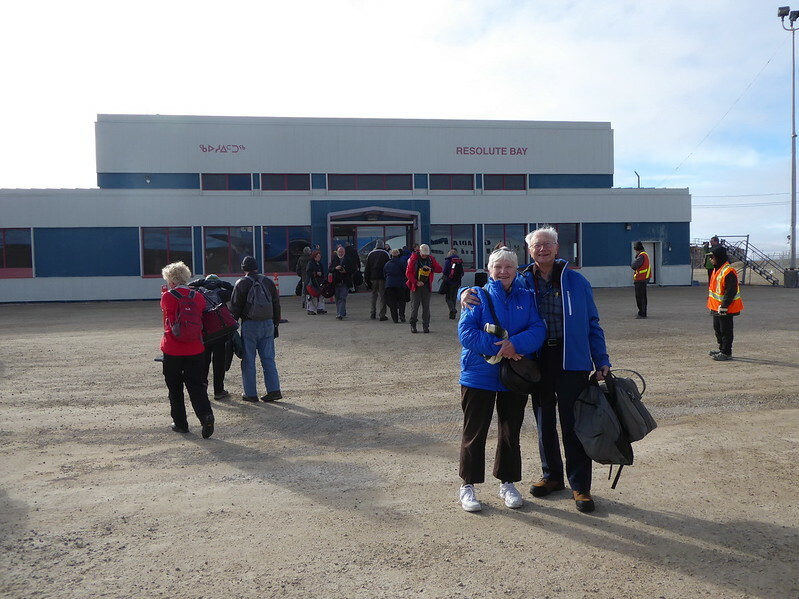 We heard that there was considerable snow in Resolute by the time we returned through Iqaluit. Looking towards shore - barren tundra. 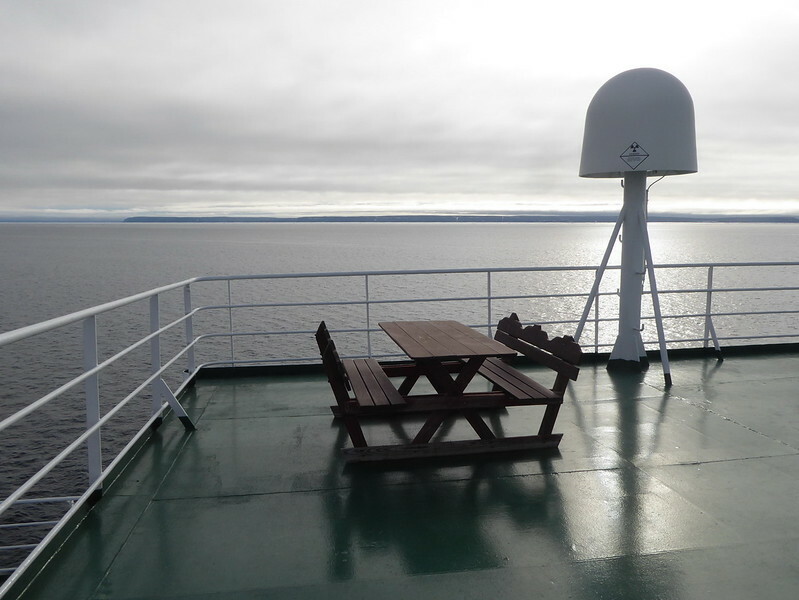 Not sure anyone used the picnic table on the top (7th) deck of the Vavilov as the highest temperatures we saw were about +5 C.
Looking to the stern from Deck 7, the observation deck. There's a hot tub on the smaller deck and it got used, particularly after people returned from bone-chilling Zodiac cruises. Looking to the bow from deck 7. 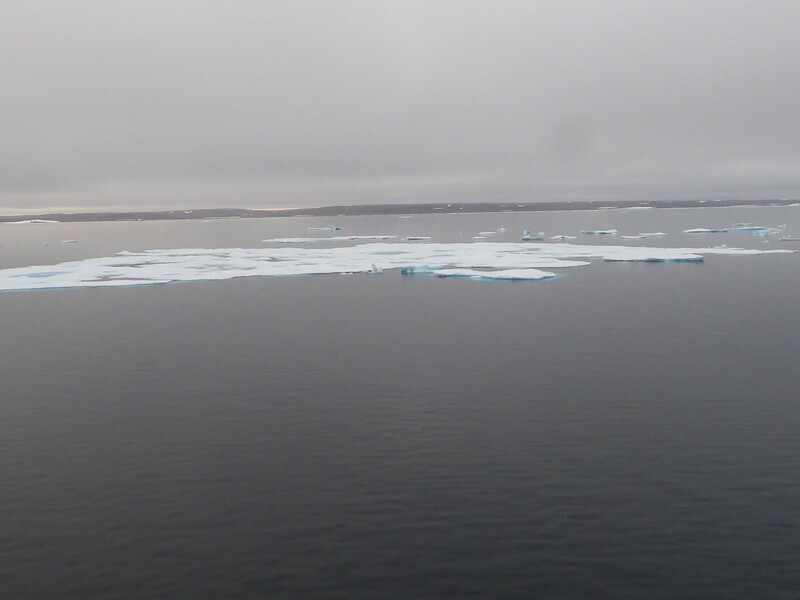 Ice floes in Barrow Strait of Lancaster Sound. 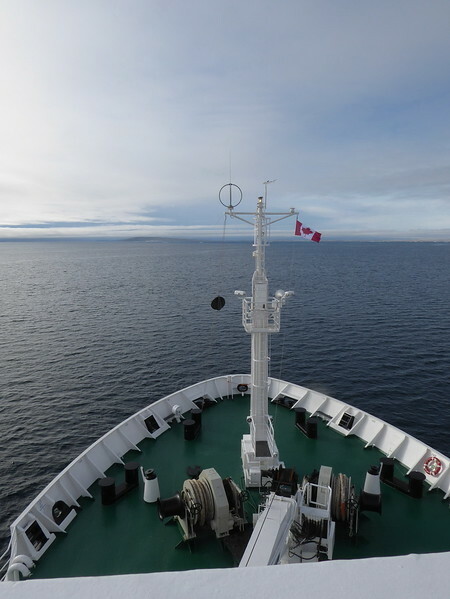 Looking out on Barrow Strait of Lancaster Sound. 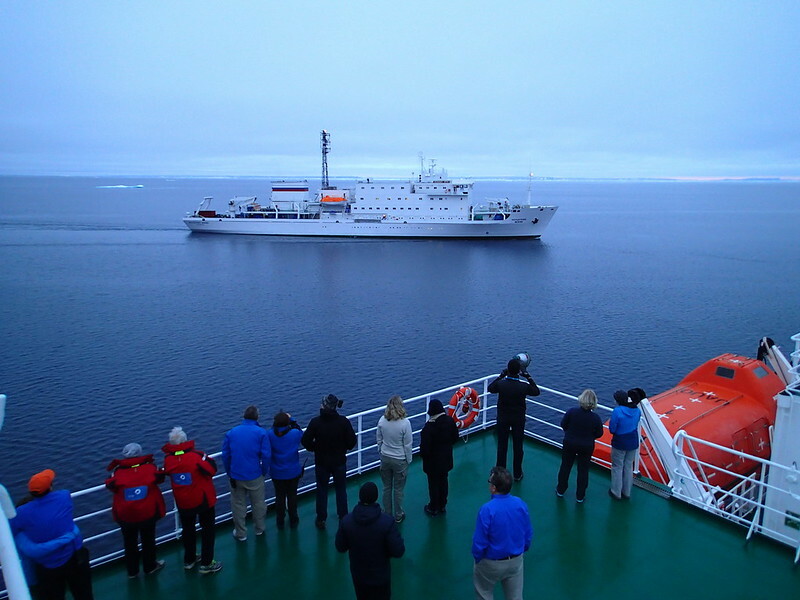 Meeting the sister ship, Akademik Ioffe. 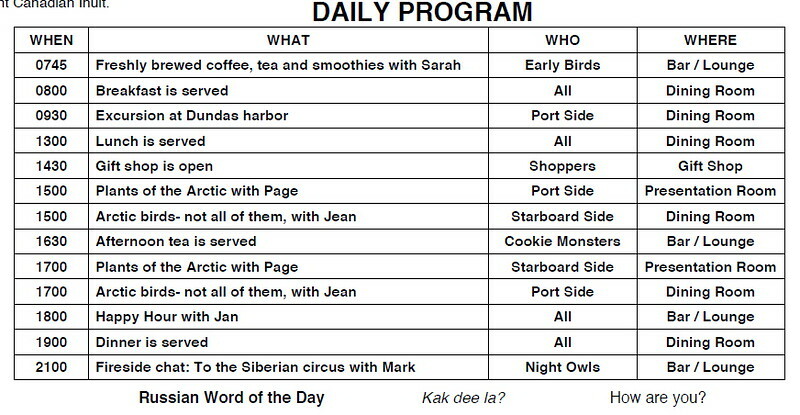 Not my photo - one that was borrowed from the sharing files on the shipboard computers. There were computers on the ship with photo editing tools and other computers that could be used with shipboard email accounts, but there was NO access to our regular email or any web sites. We decided not to subscribe to the shipboard email, but people could have sent an emergency message to us via the ship's system. Day 2 - Bob by his birth in our tiny cabin - the lower of a possible two births there. 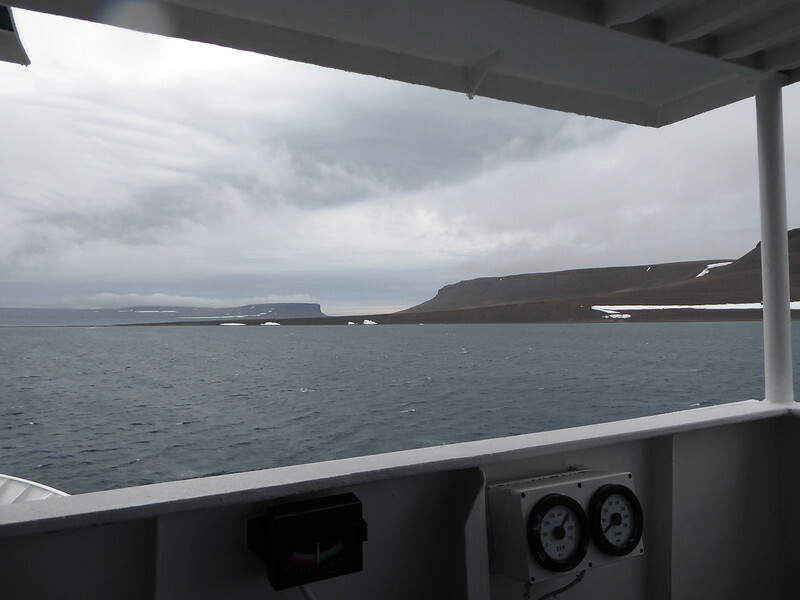 We travelled through the night along the south coast of Cornwallis Island in Barrow Strait of Parry Channel to the tiny Beechey Island off the southwest coast of Devon Island. 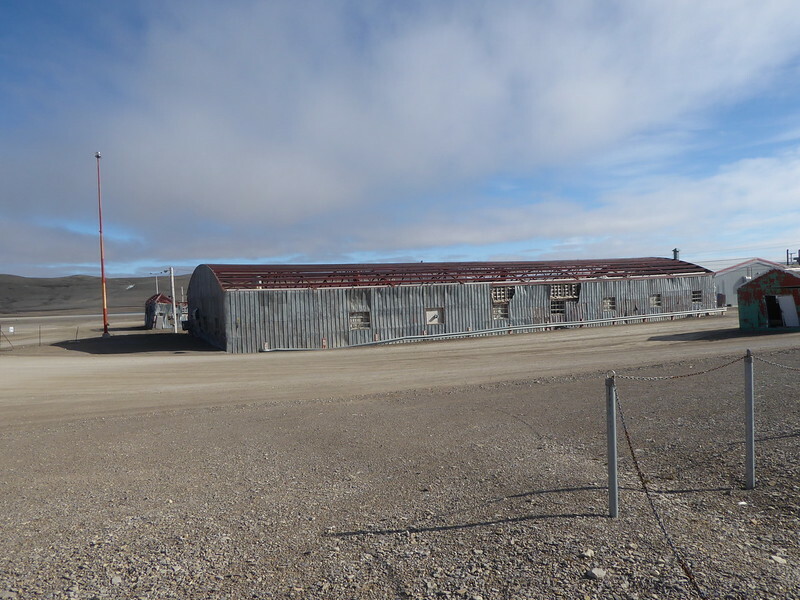 Beechey Island is noteworthy because it is clear that the Franklin Expedition spent their first winter there and three members of the group are buried there. Our afternoon was to have included a land excursion to the island and a visit to the grave sites. First, after breakfast, there was a mandatory session of safety in the Zodiacs and instruction on how to board them. 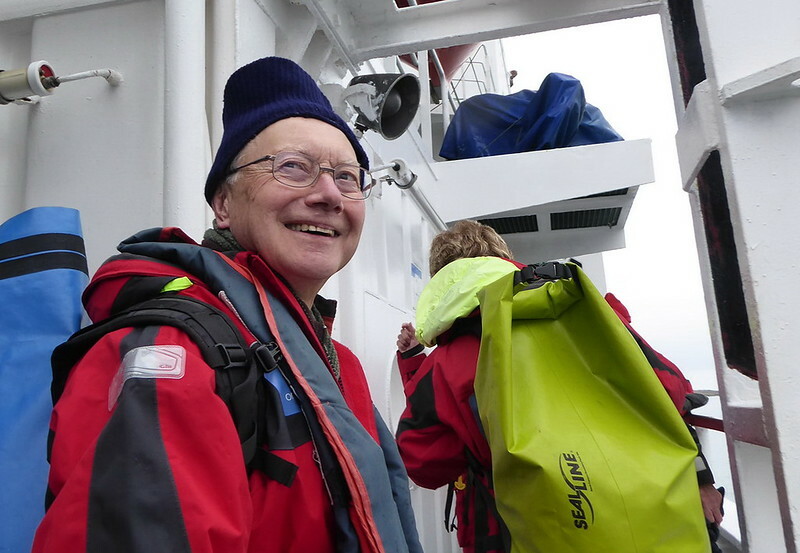 Then there was a chance to exchange ill-fitting gear, followed by an interesting talk about the Franklin Expedition by the historian on board. 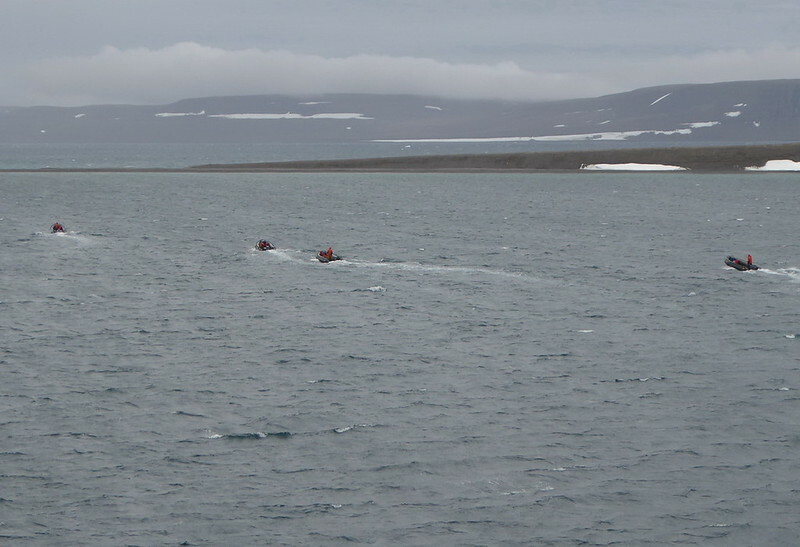 After lunch, four Zodiacs were sent to shore to check for polar bears and to check the conditions. Unfortunately, wind conditions were over 30 knots and we waited awhile. Instead of subsiding, the winds increased and it was deemed unsafe to take the group out by Zodiac. Eventually the decision was made to move on. 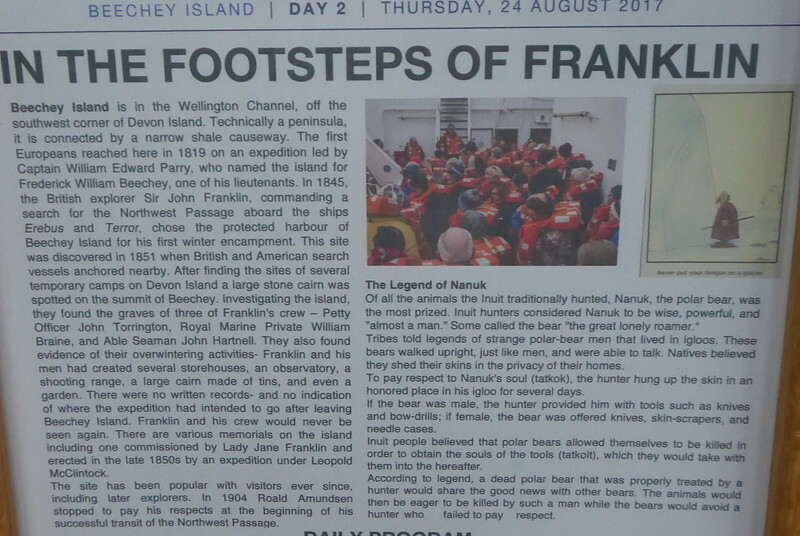 We had two extra presentations on board - one about early inhabitants of these islands - the Dorset and Thule Inuit and the other about taking pictures. 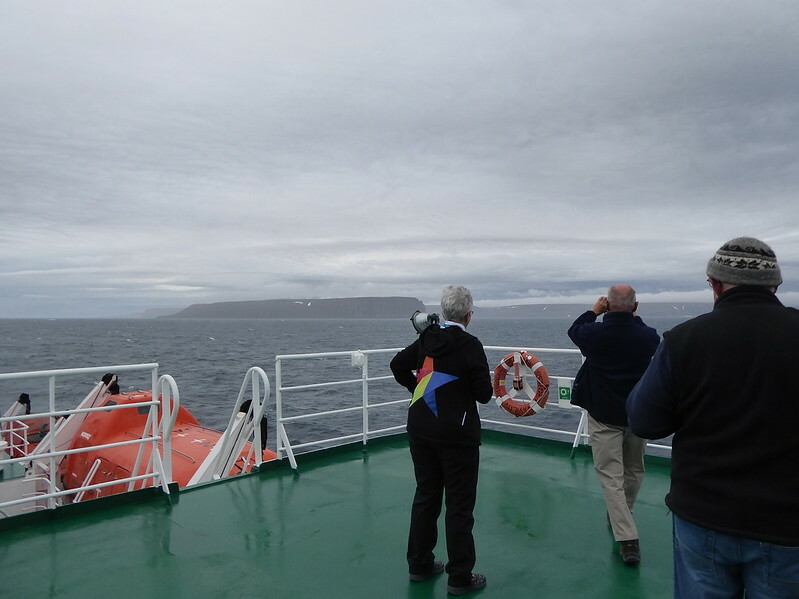 We also had to miss sailing past Prince Leopold Island, which has impressive bird cliffs, because of weather conditions. 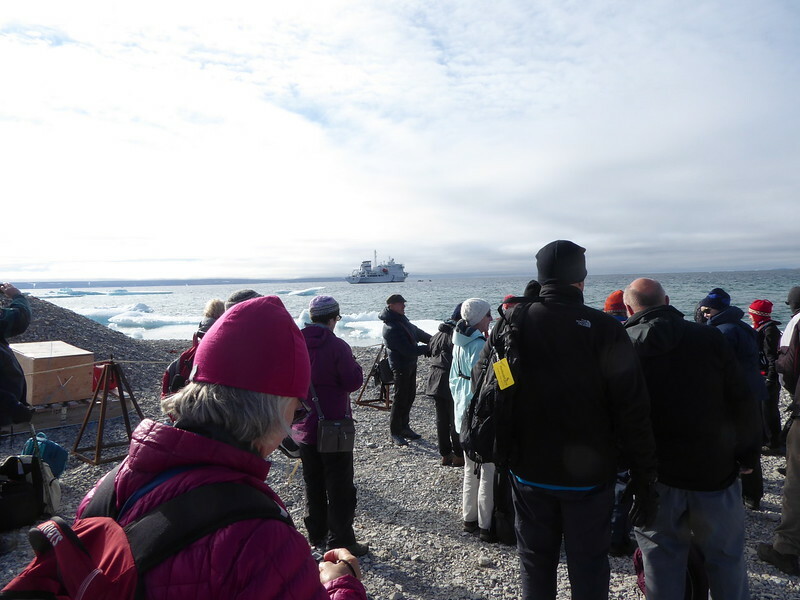 We moved east in Parry Channel along the south shore of Devon Island to Dundas Bay, a large bay at the east end of the island with the plan to make a land excursion to visit ruins of an old Thule settlement and to see plants and possibly, animals. 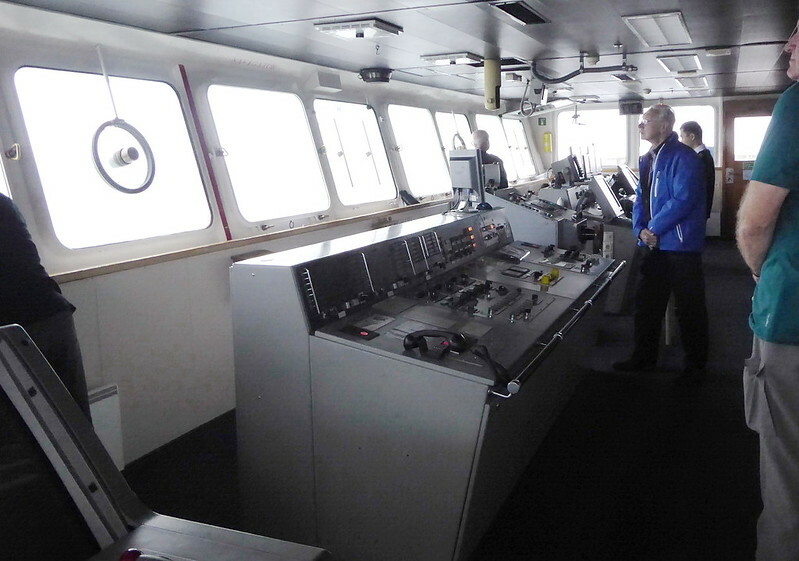 Bob on the bridge of the Vavilov. It was open to us much of the time unless they were threading their way through thick fog or lots of ice. Ann's birth was under the window. Had to be careful about the desk which was very close and also about the metal frame of the birth which was cold. Storage units to the left and closer to me, a tiny bathroom which was shared with the cabin next door. That bathroom was interesting - toilet, reasonable sink and shower all in a space not much larger than a normal toilet stall. 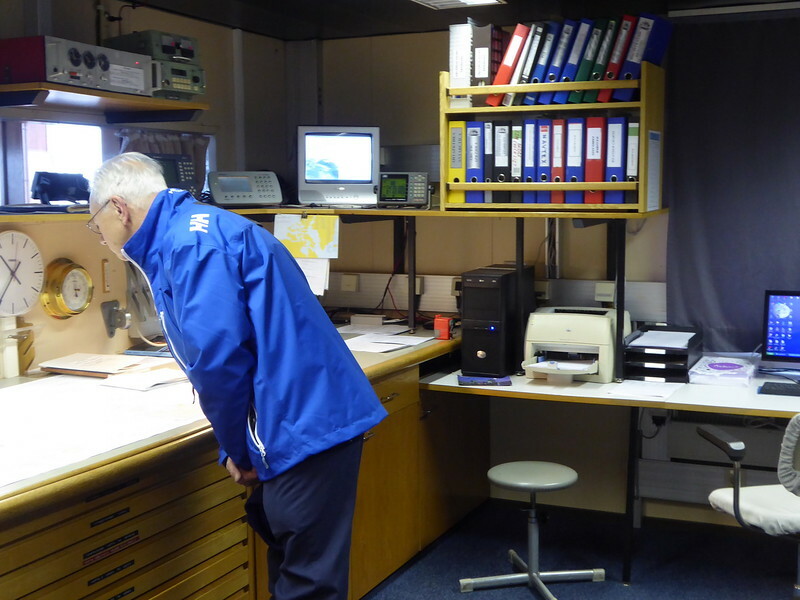 Bob in a control room adjacent to the bridge. The map. We spent much of Day 2 at point #2 on the map. 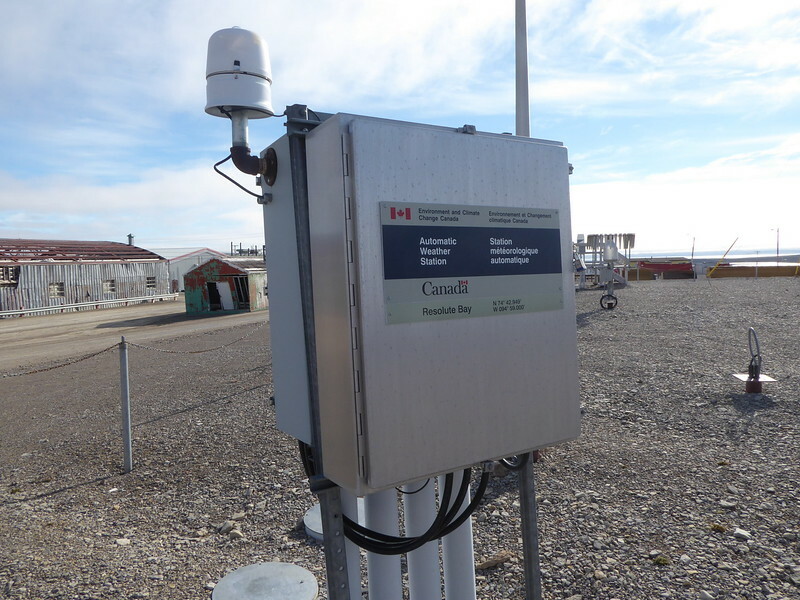 Point 1 is Resolute Bay. From the daily "Ocean Notes" newsletter. The original schedule for Aug. 24. 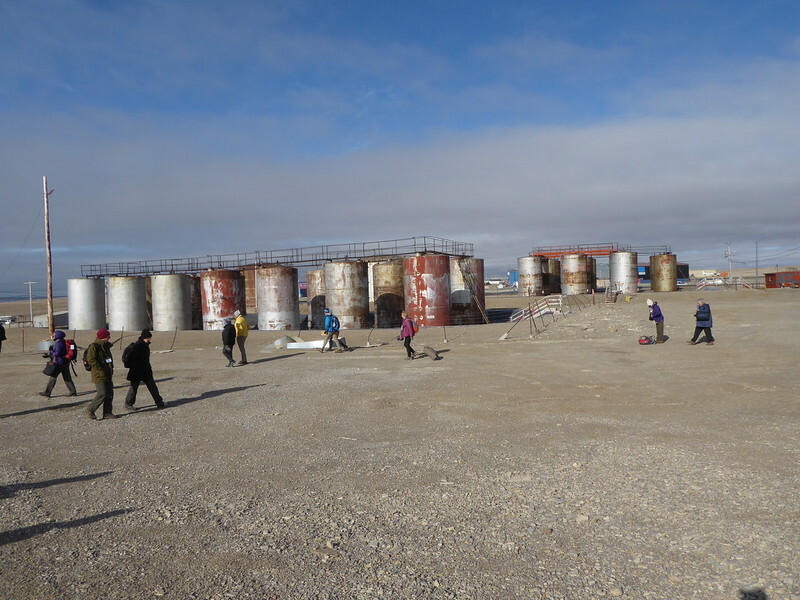 The excursion to Beechey Island had to be scrapped because of high winds. We had additional presentations instead. 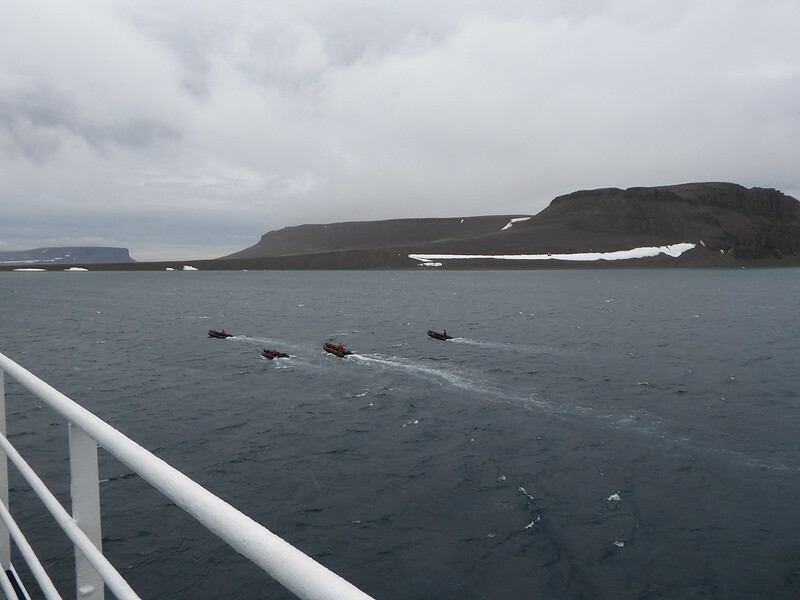 Here we are off the NW coast of Beechey Island. The Franklin crew graves are on the other side of the island, but accessible from this side and the weather was better here. 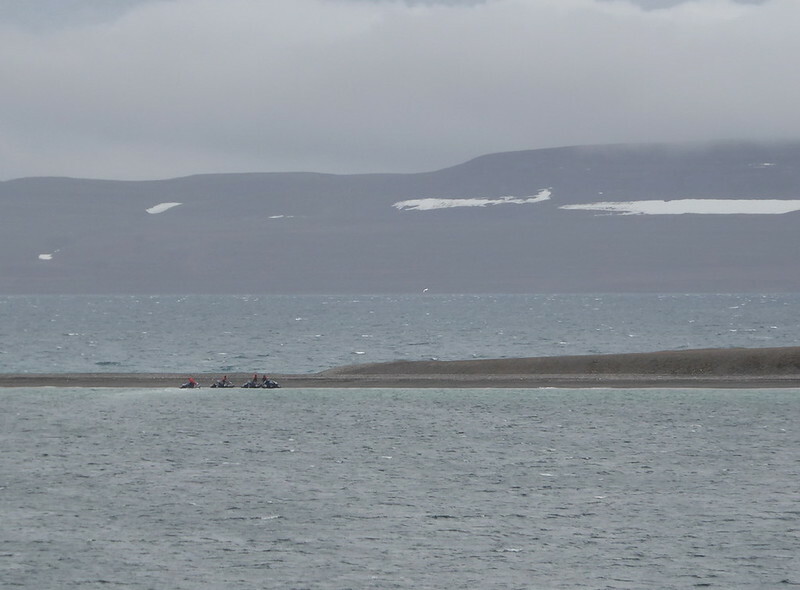 Looking at the west coast of Beechey Island. 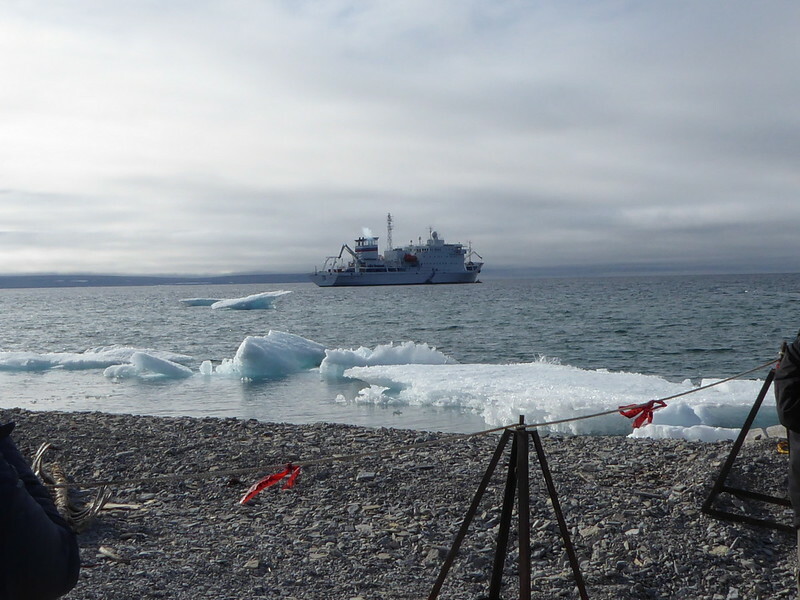 Everytime we did a land excursion, a Zodiac team was dispatched to ensure it was safe to land - no polar bears or other hazards. 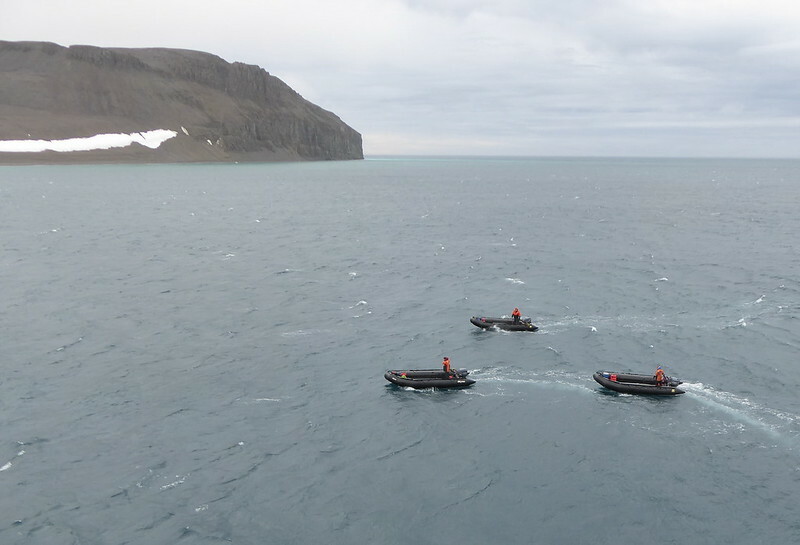 Zodiacs heading to Beechey Island. Looking forward, you can barely see them as they headed to the low point of the spit connecting Beechey to the main island. Zodiacs visible with my camera zoom. Farewell to Beechey. After an hour or so of watching the weather during which winds increased, the decision was made to move on. 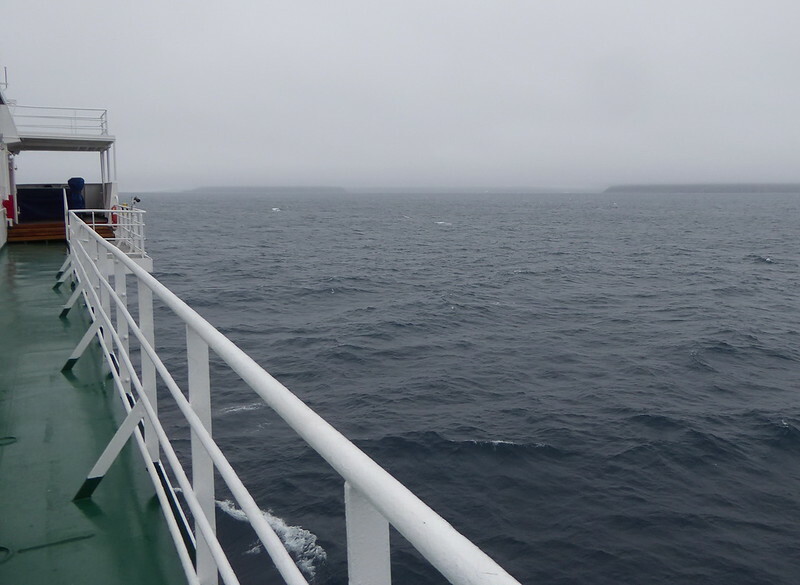 We also had to miss sailing by Leopold Island across the channel. 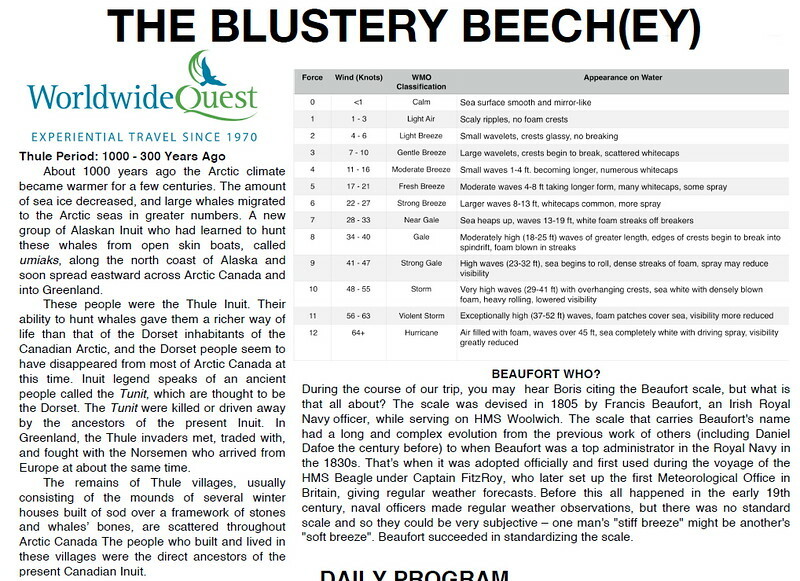 It is notable for bird cliffs and the birders on board were not happy. We were anchored in Dundas Harbour with smooth water. The Zodiacs were sent ashore, taking kayaks with them for the sea kayakers. We started leaving the ship by Zodiac, shortly after breakfast. This was the first experience for most of us with full Arctic gear. 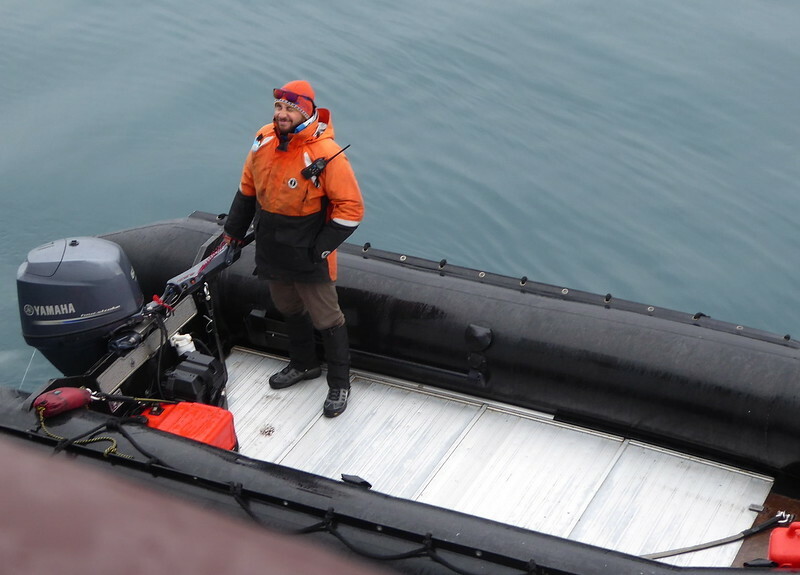 The temperature in the early morning was 4 degrees C but by the time we started boarding the Zodiacs, it was raining lightly. The excursion at Dundas BayHarbour was very interesting. The Zodiac ride was smooth. Once on shore, we divided into three groups based on desired activity level. One group climbed the rocky hill. 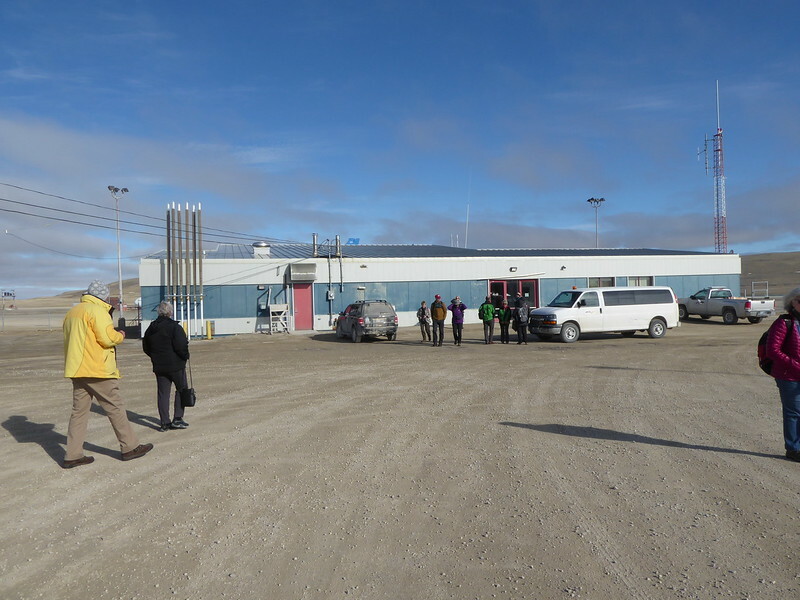 The middle group took about a 5 km walk to an abandoned RCMP station, overland to the next bay. Because of concerns about whether my boots fit well enough for a full 5 km walk (I have very narrow feet and decided on a size smaller than usual), I opted to stay with the slowest group which still covered about 2 km on sometimes rough or soggy terrain, but stopped a lot to look at plants and animals in addition to Thule Inuit house remains and burial sites. My own hiking shoes are more shoes than boots and not waterproof; so like most, I stayed in the gear provided. 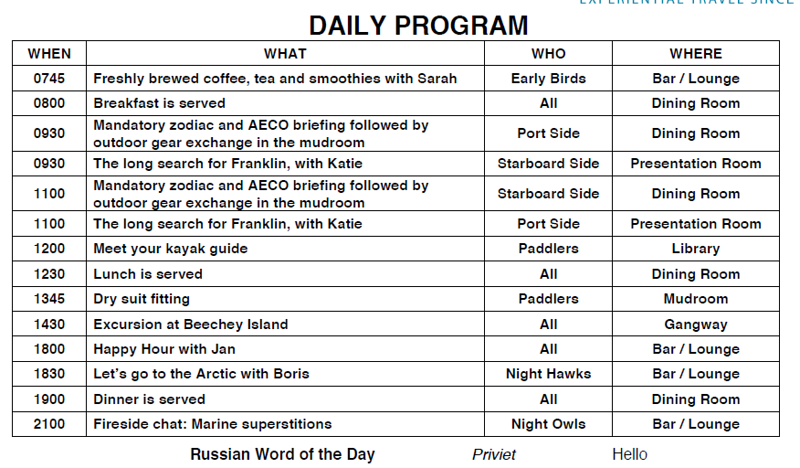 I was among the earlier Zodiacs back to the ship and early for lunch. Bob had sturdier hiking boots of his own and chose the middle level activity group which arrived back on board a bit later. After lunch, we had two information sessions, one each on plants and birds in the region. 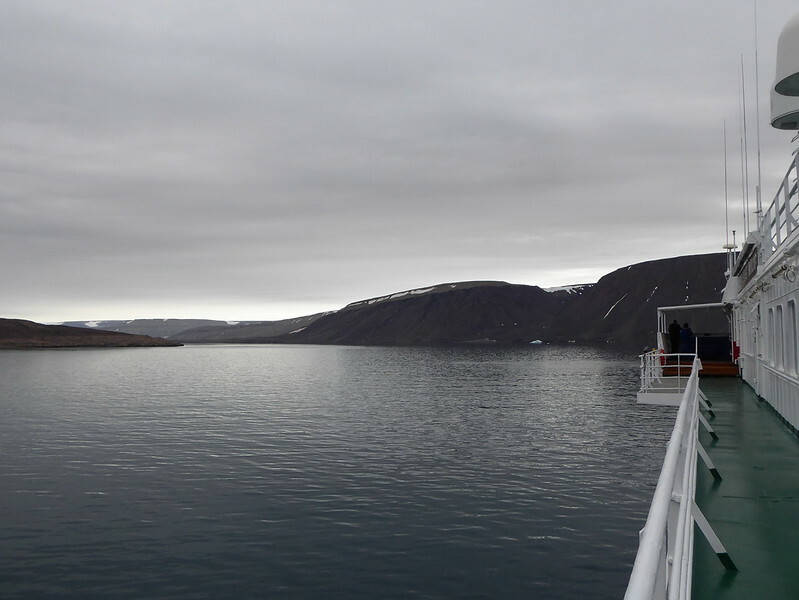 We moved on fairly quickly as the next destination is Grise Fjord which is a community of Inuit who were forcibly relocated some years ago. 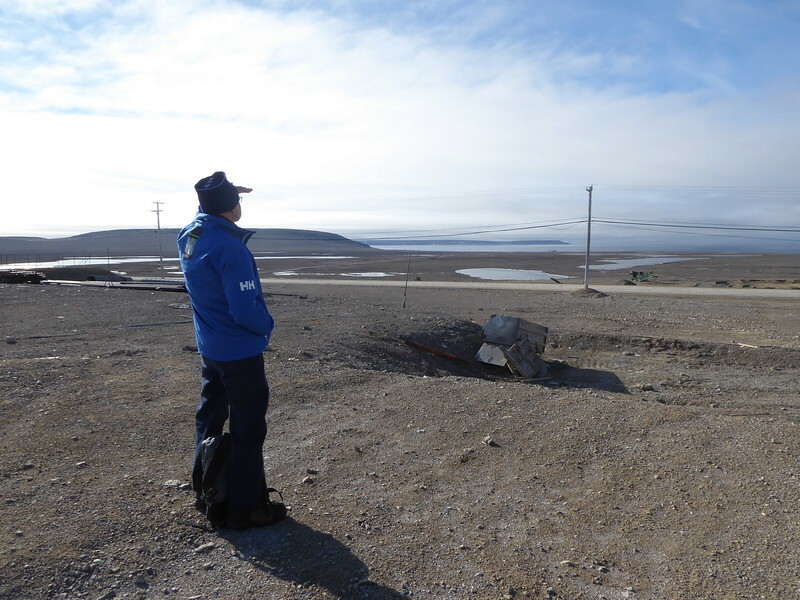 It is also the northernmost community in Canada. 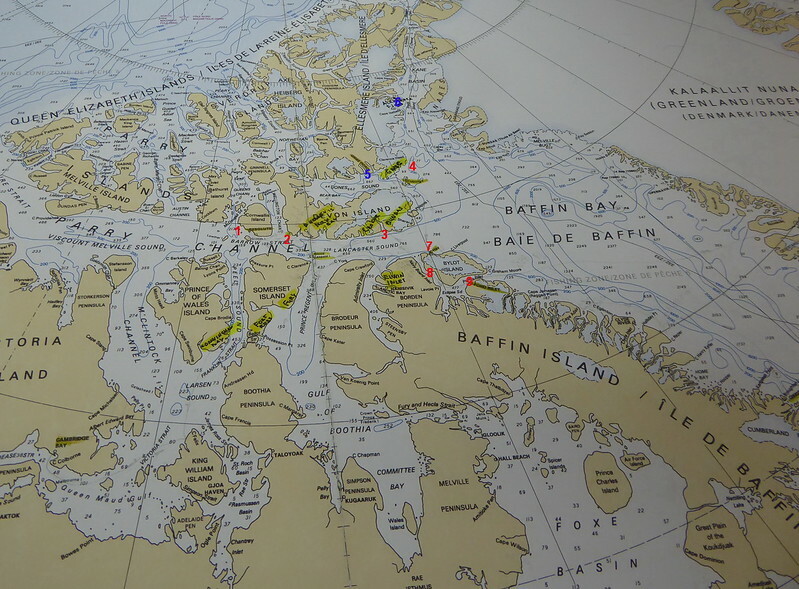 As I write, we are progressing around the east and north side of Devon Island in the northern end of Baffin Bay. There is more movement of the Vavilov now and we’ve seen some interesting icebergs. 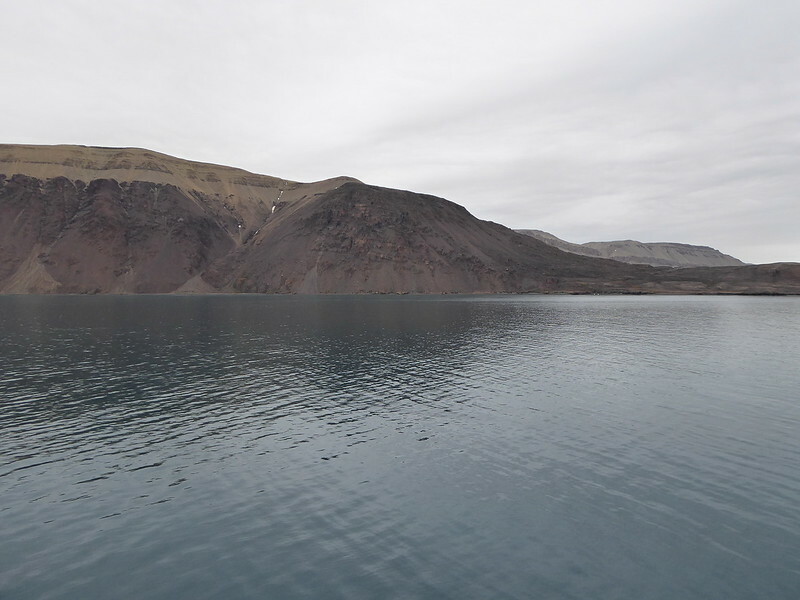 Grise Fjord is on the southern side of Ellesmere Island which extends the closest to the North Pole of any of the Canadian Island. 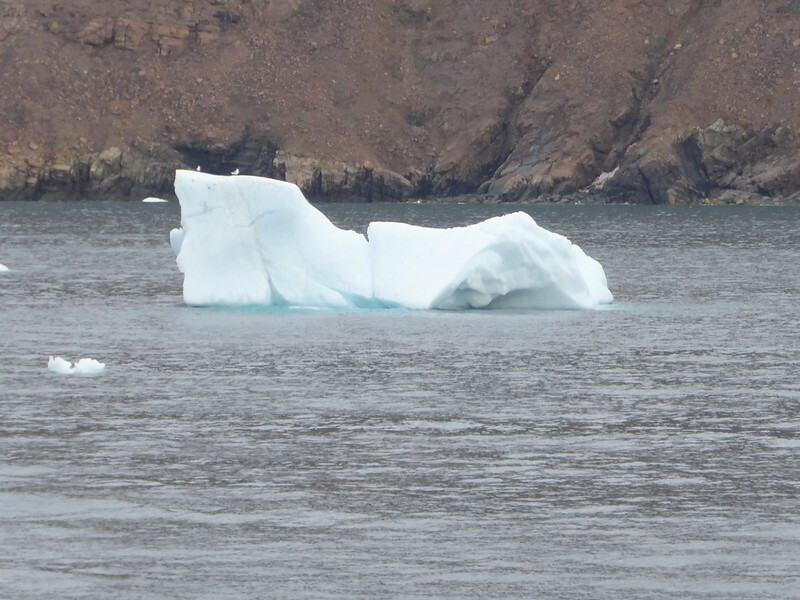 Grise Fjord is 76.4190° N, 82.9016° W.
Small iceberg in Dundas Harbour. Looking out at the smooth water of the bay. Looking out at the smooth water of the bay. Ready to board the Zodiac. Bob in line for the Zodiac. The rubber pack packs would hold different boots or jackets if we wanted to change once on shore and they could generally be left close to the water. One of the Zodiac drivers - all One Ocean staff.